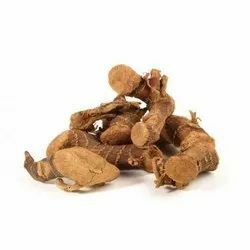 Known as a reliable manufacturer, supplier and export, we offer a wide range of Galangal root. NK Grains & Spices Trading Co.
Owing to the wide experience of this domain, we are instrumental in offering Galangal Root to our clients. Trade Name :: kolinjan, dumpurashtram, perarathai, malai inchi and panchad. 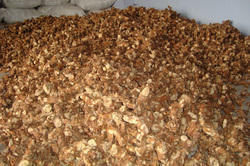 The company is a prime Galangal Roots Manufacturer and Supplier in India. The roots have the scent of ginger and therefore, it is used as a substitute of ginger in many regions. Besides, these have good digestive properties like ginger and can be put in tea to add flavor. It is used in various oriental cuisines. Though it is related to and resembles ginger, there is little similarity in taste. In its raw form, galangal has a citrusy, earthy aroma, with hints of pine and soap in the flavor. It is available as a whole root, cut or powdered. The whole fresh root is very hard, and slicing it requires a sharp knife. Common Name : Kulanjan, Galanga Root, Greater Galanga. Alpinia Galanga rhizome is used against rheumatism, bronchial catarrh, bad breath and ulcers whooping colds in children, throat infections, to control incontinence and fever. USE : The rhizomes are useful in rheumatism and catarrhal affections. The drug is a popular remedy for many respiratory ailments.